A LATE BRYAN Magee free salvaged a draw for Cavan in their Allianz Football League Division 2 opener against Clare at Ennis this afternoon. The Banner County looked to have snatched victory through Keelan Sexton but Magee stepped up to slot over in injury time as the sides shared the spoils at Cusack Park. Following relegation from the top tier last term, Cavan got their campaign off to a flying start through Caoimhin O’Reilly’s early goal but the hosts responded strongly through points from Conor Finnucane, Eoin Cleary and Sexton. 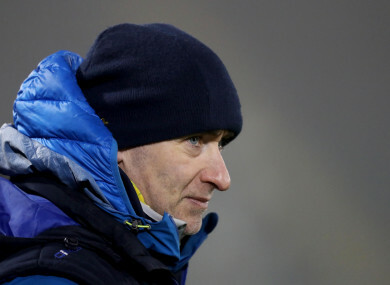 Clare led at the break 1-7 to 1-2 but the Ulster men enjoyed a purple patch as they struck through Dara McVeety to regain a stranglehold, but late drama — including a black card for Clare’s Gary Brennan — meant both sides had to settle for a draw. Meanwhile, Carlow opened their Division 4 campaign with a 2-14 to 2-9 victory over London in Ruislip. Goals in either half from Eoghan Ruth and Jordan Morrissey saw the visitors emerge as five-point winners. Earlier, Laois opened their league season with a 2-12 to 0-9 win over Limerick. Email “Late Magee free salvages draw for Cavan as Carlow leave London with the points ”. Feedback on “Late Magee free salvages draw for Cavan as Carlow leave London with the points ”.